Happy Srirama Navami to all my readers! I remember this day more clearly because of the wonderful Panakam we get to drink on this day. It is made only on this day and never after that. I really think we should include it as a regular one as Panakam is an excellent drink. Amma always celebrated this festival in a grand way. On my part, I was really very happy that I finally made some of these today. I confirmed with Athamma if she makes anything special or specific on this day, she said I can go ahead with whatever my mom makes. So I made Panakam, Majiga and Vadapappu. 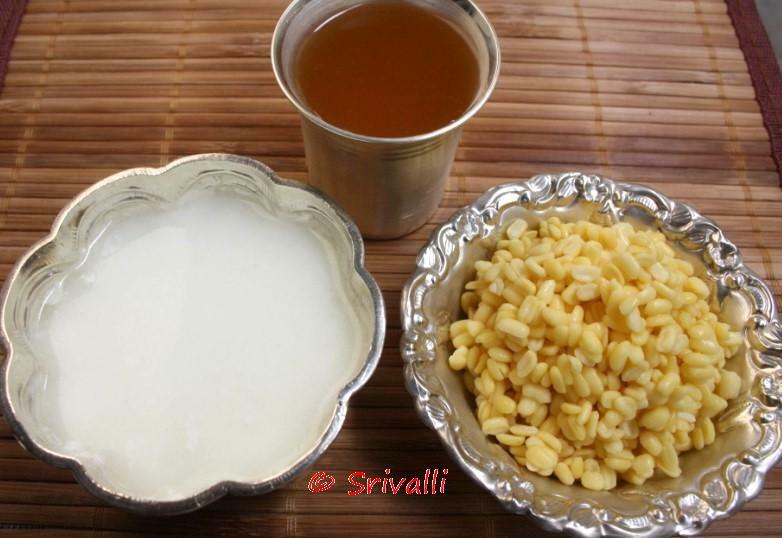 The following are the traditional recipes prepared during Sri Rama Navami at my parents place. Vadapappu is normally offered as just the dal. It is then seasoned and offered to everybody. Powder the jaggary well and mix in the water. Dissolve it well. Filter it in a muslin cloth or a filter. Then add lemon juice and cardamom powder. Mix well and offer as neivedyam. This is normally served chill, stored in earthen pots which makes it cool naturally. Else refrigerate to serve chill. With the sun showing up very bright, this drink cools the body. What you see in the picture is how it is offered to God, I couldn’t take the salad picture. Wash and soak the dal in water for half an hour. Then drain it. After it was offered as prasadam, it is normally prepared as a salad. To make the Salad, all other ingredients are added to the dal as such and combined well. I hope everybody had a good festival celebrations, do share how your day was! Wishing you a very happy Sri rama navami, Srivalli. Its new to me…..Happy rama navami.. Happy Ram Navami to you too! Everything looks so festive! We add pieces of banana and coconut to the dal – ages since I had it. Srivalli, good neivaedyam. I will try chana dala vada.